International subsea services provider DOF Subsea has chosen acoustic and inertial navigation technology from Sonardyne Brasil Ltda. to support its deepwater operations from three vessels offshore Brazil. The three vessels will be equipped with Sonardyne’s SPRINT-Nav all-in-one subsea navigation instrument for underwater vehicles. A remote operated vehicle (ROV) on one of the vessels will also be fitted with a Sonardyne Syrinx Doppler Velocity Log (DVL), in place of its existing system. All three vessels are on long-term contract in Brazilian Waters. SPRINT-Nav combines Sonardyne’s SPRINT sensor, Syrinx 600 kHz DVL and a high accuracy intelligent pressure sensor in a single housing, making it one of the smallest combined inertial navigation instruments on the market. The system not only meets stringent specifications for subsea inertial navigation, but also provides high-performance positioning all from a single tightly integrated instrument which, can also be serviced in-country by Sonardyne’s service center in Rio das Ostras. 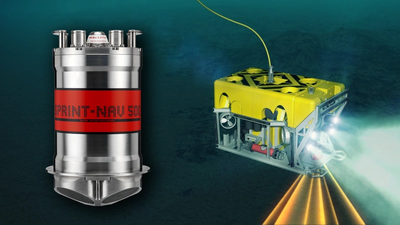 DOF Subsea’s multiple SPRINT-Nav systems will be used to support ROV operations, as part of construction, inspection, maintenance and repair (IMR) work in Brazil’s deepwater pre-salt oil fields, in depths down to 3,000 meters.